To install a new thermostat in your Ohio home, give the HVAC experts at Rick’s Heating & Cooling a call or submit an online contact form. Emerson is an industry leading company providing top climate control technology. We proudly install the two thermostats below. If you want to lower your heating and cooling bills, a programmable thermostat is an absolute must. Programmable thermostat installation is one of the easiest and most effective things you can do to improve your home’s efficiency year in and year out! 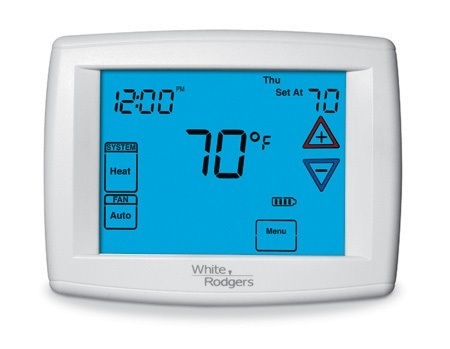 Programmable thermostats allow you to preset temperatures throughout the day based on your needs. When the kids are at school and you’re at work, set the temperature at a level that wouldn’t be comfortable if you were all home but will allow your AC or heater to run most efficiently. Set a more comfortable temperature for when everyone comes back and the thermostat will start to warm up early, so by the time you get home you won’t even notice the difference! Programmable thermostats are incredibly easy to use and provide real energy savings – in fact, every degree cooler or warmer (depending on the season) for eight hours, can save you 1% or more on your heating and cooling bills (source)! Call Rick’s Heating & Cooling to Install a Programmable Thermostat Today! At Rick’s Heating & Cooling, we’ve installed hundreds of programmable thermostats throughout Cincinnati, Maineville, Morrow, Lebanon and Mason, Ohio. 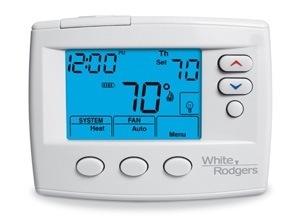 Want to start experiencing the energy saving benefits of a programmable thermostat? Call Rick’s Heating & Cooling today for programmable thermostat installation!